Eight best-selling authors from both sides of the Atlantic. One free book. 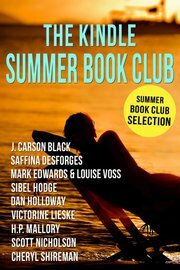 The Kindle Summer Book Club features stories, articles, and novel excerpts from best-selling writers in the United States and United Kingdom, all for free at Smashwords and BN.com. The book will be 99 cents at Amazon, with all proceeds going to disaster recovery in Joplin, Mo. Features H.P. Mallory, Cheryl Shireman, Victorine Lieske, Sibel Hodge, Mark Edwards, Louise Voss, the Saffina Desforges partnership, Scott Nicholson and J. Carson Black. We’ll have a summer of events and giveaways as well, so be sure to follow our Facebook page for the latest news. Mystery, paranormal, thrills, chills, and romance all in one tight little package.